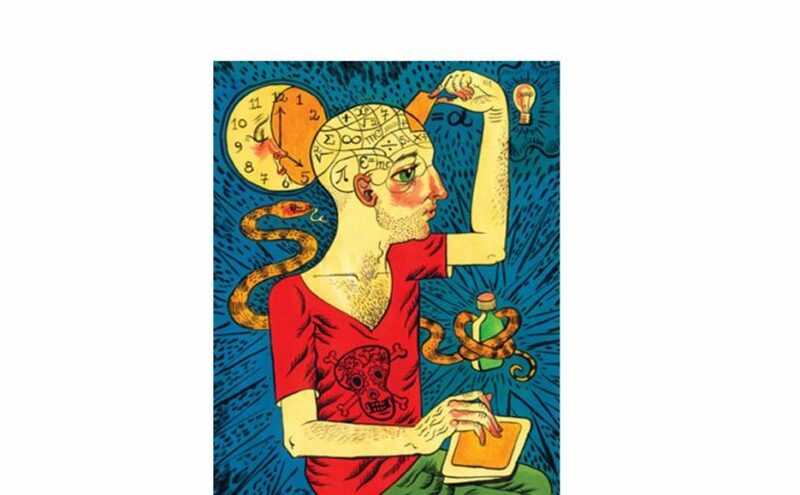 People are busily experimenting with “smart drugs”; college students, people in high pressure jobs, creative types in general, neurohackers, and those who fear diminishing cognitive ability with age. These nootropics are commonly referred to as memory enhancers, cognitive enhancers, PIEDs and noots. They include designer drugs, supplements, nutraceuticals, functional foods or combinations of these that claim to improve one or more aspects of mental function, like memory, concentration or alertness. The interest stems from the universally appealing idea of self-improvement through minimal effort. You can dive deep into the smart drug culture here, here and here. Andrew McMillen wrote a very entertaining article on the whole phenom for Rolling Stone. Of course natural stimulants have been part of human society forever (tea, coffee, coca, jimson weed, Ayahuasca, psyilocibin, etc. ), but McMillen traces the recent interest to the 2011 cult movie Limitless where a character named Eddie Morra acquires superhuman abilities after taking the drug NZT-48. Of course, NZT-48 doesn’t exist, but online communities like LongeCity , Bluelight, and especially the subreddit /r/nootropics are evidence of a massive crowd sourced psychology experiment in search of the real thing. The idea behind nootropics is to target some metabolic or nutritional aspect of brain function and then provide a precursor to that pathway, or a drug that enhances the activity of a neurotransmitter, enzyme, or neurohormone. Nootropics work in one of three ways; by altering the availability of the brain’s supply of neurochemicals, by improving oxygen supply, or by stimulating nerve growth and neurostem cells. Depending on who you ask, they can be anything from Adderall to caffeine, with an array of unregulated and largely untested chemicals or herbs in between. Both cocaine and amphetamine were once considered to have nootropic properties, but they are wildly addictive and destructive and therefore out of favor with the “smart drug” crowd, although one amphetamine is still widely prescribed under the name Adderall. The truth is that nootropics and PIEDs (performance & image enhancing drugs) are often hyped without adequate evidence of positive effect or even safety. Under the circumstances, it is user beware as there is absolutely no regulation in this marketplace. With all the popular interest, however, the important questions are these: Are there substances that really do enhance cognition and memory? Are they safe? And, are they beneficial in the big scheme of things? The following describes ampakines, a class of neuroactive molecules that just might fit the bill, and help us better understand how the brain works at the same time. As we age, neurons in our brains begin to regress and die as the number of synaptic contacts they make with other neurons gradually decreases. An early sign of this is that the dendrites gradually shrink much like pairing limbs from a tree. Dendrites are the elaborate branches that extend out from a neuron to receive synaptic contacts from other neurons. This is where information is passed between members of a neural circuit. The causes of dendrite retraction are not fully known, but it seems that active synapses send a signal that both sustains the dendrites and encourages them to grow, maintaining the integrety of the circuit and also providing greater surface area for new synapses to form, thus strengthening the circuit. When synapses are lost, the maintenance signal is also lost in a striking example of use it or loose it. The retraction of dendrites is widely thought to contribute to cognitive decline. It is also thought to be an inexorable and irreversible process that begins in middle age; certainly a depressing thought. Recently, researchers at the University of California, Irvine found a way to reverse the retraction process. In their study (source is here), they added what may legitimately be called a nootropic to the diet of middle-aged rats at a time when dendrite retraction was already underway. The supplement is a member of a class of compounds called ampakines. Ampakines enhance the strength of signaling at synapses that employ a particular type of receptor to the neurotransmitter, glutamate, called the AMPA receptor. AMPA receptors play essential roles in memory formation and also in communication between different regions of the brain. A loss of AMPA receptors results in a reduced level of excitatory stimulation, something that is implicated in Alzheimer’s disease, schizophrenia and impairments to learning-related synaptic plasticity. Ampakines were already known to increase production of a key neuron growth factor, brain-derived neurotrophic factor (BDNF). The current study showed something new; that supplementing the diet with an ampakine over an extended period could prevent cognitive deficits by somehow protecting the dendrites from regressing. A group of middle-aged rats that were already experiencing dendrite loss received an oral dose of ampakine every day for three months while others received a placebo. During that time their behavior was recorded as they explored unfamiliar environments. Afterwards the researchers imaged an area of the brain closely associated with learning and memory, the hippocampus, and compared the images from the two aged groups along with images from young, adolescent, rats. Middle-aged rats given the placebo had shorter dendrites with fewer branches than the young rats. The brains of rats given the ampakine supplement, however, were almost indistinguishable from those of young rats. Moreover, treated rats had significantly more dendritic spines, the small projections on dendrites where most synapses are made, than either the untreated rats or the young ones. This implies greater synaptic connectivity and possibly greater learning capacity, in those whose diets were supplemented with ampakine. Differences between the treated and untreated animals also showed up in behavioral tests. Typically, rats placed in a new environment spend a lot of time exploring. As they become more familiar, they settle down. Rats receiving ampakine rapidly learned the environment while the placebo group continued randomly exploring, something that is characteristic of advanced age in rats. This implies that ampakine supplement actually reversed the effect of aging in the brain. There is more; there were also improvements in synaptic plasticity and the encoding of long-term memory. This raises the hope that ampakine supplements will produce cognitive benefits worthy of the title “smart drug”. An ampakine called Ampalex® (CX-516) is in clinical trials for the restoration of mental function in patients with dementia and, so far, it seems relatively free of serious side effects. It is not FDA approved and not yet available to the public. But if you search, you can find lots of products claiming to contain CX-516 or a host of other purported ampakines, but think carefully and check the on-line user groups before experimenting with any of them. Because of the promising results with ampakines, and all the public interest in nootropics in general, I think it is worthwhile to take a brief look at one the most widely used smart drugs out there. Piracetam is a favorite of the “smart drug” community. It has been around for decades and is the original “nootropic”. It has a positive effect in that it strengthens signaling at synaptic receptors for glutamate and acetylcholine. Studies beginning in the 1970s reported possible benefits, especially in the elderly, but this hasn’t always panned out in later work. There’s no clear evidence of benefits in healthy 20-somethings even when taken over the long term, although there are only couple of studies on healthy people. Moreover, when piracetam has been studied specifically for memory and cognitive enhancement in cases of dementia or cognitive impairment, no specific benefit was found in these individuals, either. The only conclusion you can draw about piracetam is that everything is still up in the air, and I think that probably applies to the all the other smart drugs. The current interest in nootropics seems to reflect society’s overwhelming focus on achievement and productivity. In a world where human workspans and lifespans are increasing, it seems inevitable that cognitive enhancement tools will become increasingly popular, even important in a societal sense. This is something to be taken seriously because neuroscience will find those tools, no question about it. Most people accept caffeine as a stimulant and a normal, for some essential, part of daily life. If cognitive enhancement is the goal, then nootropics will be the next “caffeine”. This is the kind of thing that occupies the futurists amung us and if you find this stuff interesting, as I do, here are three links to get you started – 1, 2, 3.